FREE Barilla Pasta Sauce at Safeway! Every once in a while there is an amazing personalized deal with the Just For U program at Safeway. Here’s one now. Safeway has a one time Just For U promotion going on now for Barilla Pasta Sauce. You can get Barilla Pasta Sauce 24 oz. for only $0.99! Combine this deal with the new $1/1 printable coupon and you’ll get it for FREE! *If you can print four coupons, you’ll get four for FREE! 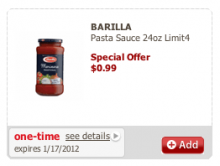 *HOT* $1/1 Barilla Pasta Sauce Printable Coupon! 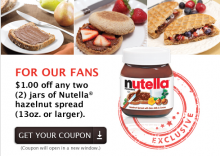 Head on over to Coupons.com and print this high value Barilla coupon. You can get a printable coupon for $1/1 Barilla Pasta Sauce when you use zip 90210. Print this coupon quick, it won’t last! There is a HUGE sale today on Restaurant.com gift certificates. 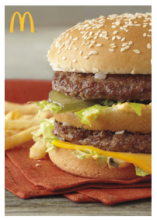 You can get a $25 gift certificate to select restaurants for only $1! We use them often and these gift certificates make a night out so much more affordable! Head over to Restaurant.com and see what restaurants are in your area. This offer is good now through December 24th! Grab a couple to keep for yourself or put in someones stocking! Use code: JOY at check out to get your discount. I love making pies but hate making pie crust. I just found a coupon for my pie crusts at Coupons.com. Here are a few coupons you might be able to use as you head out for last minute Thanksgiving shopping like I just did. Holiday inspiration from Safeway, PLUS $100 Safeway gift card giveaway! Visit Safeway.com/Holiday to review recipes, entertaining ideas, wine pairings and other helpful tips. Then build your list of favorites and come back to see what other inspirations you want to create for your family. I just saw some easy holiday table ideas that are perfect for any table setting. 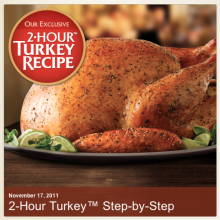 For iPhone users, download the Safeway Chef Assistant app featuring the Safeway exclusive 2-Hour Turkey Recipeâ„¢. The app guides you through step-by-step instructions on how to prep a simply delicious turkey in 2 hours or less. I’d love to fix a turkey in 2 hours or less, wouldn’t you?! You can also use the app while shopping for your ingredients and cooking tools or as a timer to remind you of important time and temp checks. And finally, don’t forget to play the Facebook LOL Turkey Game. You’ll get a good laugh, plus you’ll be entered to win a gift card from Safeway! Safeway would like you and your family to have a wonderful Thanksgiving. They are giving one lucky Frugal Day reader $100 Safeway gift card to use this holiday season. Happy Thanksgiving from Safeway and Frugal Day! Please use a valid email address, this is how I will contact the winners. Giveaway will end at 8:00am PT on Monday November 21st. One winners will be chosen randomly using â€œAnd the Winner Is:â€ a WordPress plug in. Good Luck! Open to US residence only.